Susan Cain is another acclaimed public speaker and author, broadcasted over social media by her viral TED Talk, "The Power of Introverts", based on her book Quiet. This book led to the foundation of Quiet Revolution - a company "dedicated to unlocking the power of introverts" (see their website here). Quiet is a book for the soft-spoken, the listeners, the withdrawn, and the thinkers. There are many more attributes that could be singled out, and these listed may not apply to every introvert across the board, but Quiet is a book about introverts, introversion, and the rise of the Extrovert Ideal. According to Cain's extensive research, included in detail in this narrative, we live in an extroverted culture. Our schools, workplaces, and media all perpetuate and praise the power in and desire for extroverted students, leaders, and characters. And while extroversion is indeed a powerful, beautiful characteristic, the undervalue of introverts continues to grow deeper. Susan Cain takes it upon herself to highlight and lift up the overlooked: the ones "who prefer listening to speaking; who innovate and create but dislike self-promotion; who favor working on their own over working in teams". These are people like Rosa Parks, Chopin, Dr. Seuss, Steve Wozniak - at least one-third of the world's population consists of introverts. As such, this book is a book by an introvert, for introverts, but it is as much for the introverts as it is for the extroverts who need to understand them. They need to understand each other, in order for the structures of culture and social life to work together in uplifting and healthy ways. 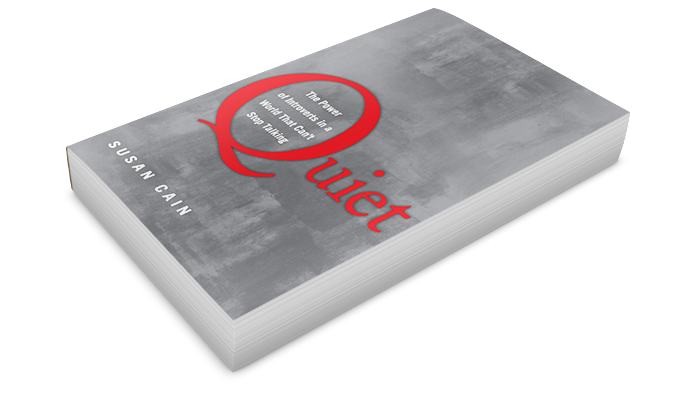 For more information on Quiet by Susan Cain, visit our website here. Brené Brown is an acclaimed researcher and public speaker, perhaps best-known for her viral TED Talks, "The Power of Vulnerability" and "Listening to Shame". Her book Daring Greatly expands on these ideas, tying her extensive studies and research in worthiness and shame with empathy and vulnerability, but this last is the main focus. Her list goes on for a page and a half more examples of what is regarded as vulnerability, to which Brené applies a questions: "Do these sound like weaknesses" (p. 37)? And her answer is a resounding, satisfying and powerful no. She writes "vulnerability sounds like truth and feels like courage", two things which may be uncomfortable but would never be considered weaknesses. This is only a few pages out of the larger picture of this book as a whole, but Daring Greatly is brimming with page after page of these brilliant, powerful sections about honesty, courage, and emotion. There is an entire chapter on applying this knowledge to parenting, and another on education and work. Brené's other book, I Thought It Was Just Me (But It Isn't), takes the concept of shame that she writes about in Daring Greatly and delves even deeper into the studies and research that she has compiled over the years, specifically surrounding shame in the lives of women. Daring Greatly is a compelling precursor, guaranteed to make you pause and redefine your patterned, maybe harmful, ways of thinking. For more information on Daring Greatly by Brené Brown, visit our website here. "So Moses chiseled out two stone tablets like the first ones and went up Mount Sinai early in the morning, as the LORD [Yahweh] had commanded him; and he carried the two stone tablets in his hands. Then the LORD [Yahweh] came down in the cloud and stood there with him and proclaimed his name, the LORD [Yahweh]. And as he passed in front of Moses, proclaiming, "The LORD [Yahweh], the LORD [Yahweh], the compassionate and gracious God, slow to anger, abounding in love and faithfulness, maintaining love to thousands, and forgiving wickedness, rebellion and sin. Yet he does not leave the guilty unpunished; he punishes the children and their children for the sin of the parents to the third and fourth generation." The bold cover and the title is what drew me. Then when I opened it and realized he wrote a book on God and only used two verses...well that drew me even more. It's not very often that you'll find a book in the Christian Living section written solely on God. A lot are written on Jesus and his character because he came down in the flesh. We know he was man and God and that he died and people witnessed him on earth (via the Gospels). Still not an easy topic but its easier than trying to tackle God-the Almighty, El Shaddai, YAHWEH. And let me just say that John Mark Comer does a REALLY good job. He says, "When we talk about God, it turns out we're all over the map. In the West, we still live in a hangover from our Christianized past. There was a time when you could say "God," and people would immediately think of the God we read about in the Scriptures and see in Jesus. Most people would even come to the same basic conclusions about God. That time has long since gone the way of the earth. Today, when I say"God," you might think any number of things, depending on your country of birth, language, religion, church experience, background--and, of course whether or not you have cable". Which is true. Today, when talking about God, the "fear of the LORD" isn't there. Even in the church, with all the different denominations, everyone has just a slightly different view from the next person and that can get confusing (I'm thinking especially of non-Christians who want to know more). Comer writes in a way that's like you're sitting at a table with him and having a conversation. He doesn't assume you know what he's talking about, (because his audience could be anybody) so if he's jumping into a Bible story, he gives the context without going into great detail to help get the point he's trying to make across. I loved this book. It's quickly become one of my favorite books I've read so far this year. I've learned a lot about who God REALLY is, because as I quoted earlier, we've forgotten who He is. At least I had. I hadn't forgotten Him the way we forgot where we put our keys, but I forgot who He says He is. I had forgotten His character. The church today, I've noticed, is SO worried about upsetting somebody, that we focus on that God is love only, because preaching about a God who wipes out entire people groups is a tough pill to swallow. And He is love, (we can praise Him for that) but He's SO much more than that: He's merciful, faithful, trustworthy, righteous, holy, slow to get angry, forgiving, and the list goes on! So go and pick up this book! You won't regret it. 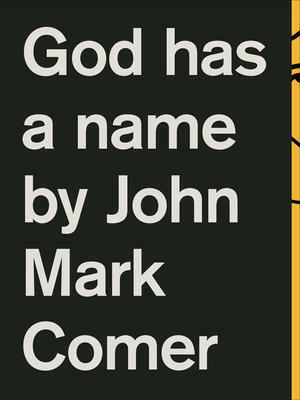 For more information on God has a Name visit our website here.